The Whitechapel murder scenes that occurred between 3rd April 1888 and 31st December 1888. Find all the Jack the Ripper Walking Tours in London, United Kingdom. Tour companies offering “Jack the Ripper” tours listed here. Get jack the ripper tour booking information, price and contact address in one place. Find Best Jack the Ripper Walk in London. London E1 7qx, United Kingdom. 12 CABLE STREET, London E1 8JG, United Kingdom. The museum is open from 9:30am to 6:30pm seven days a week. – The Jack the Ripper Walk costs £10 – or £8 for Super Adults (65+), full-time students and people with the London Walks Discount Walkabout Card. Children under 15 go free if accompanied by their parent(s). London NW6 4LW, England, UK. Discovery Tours & Events Ltd. presents Jack The Ripper Tour. Founded in 1982 and led by Blue Badge Guide Richard Jones. Enjoy the original Aldgate East Jack the Ripper Walk that features genuine Victorian photographs that show the streets are walking through as they were in 1888. London E18 1BD, England, UK. 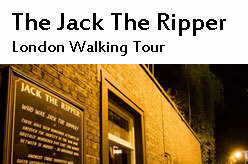 Jack the ripper tour booking : The Tour Takes Place Every Night at 7pm. Ticket price £10 Per Person and duration 2 hours. You can book your ticket here. Phone booking available. Ripping Yarns Tours presents Daily professional guided Jack The Ripper walking tours. meeting point (at 6.40 PM) – Tower Hill Tube Station, London EC3, England. Tour Booking : Book your tour online here. Jack the Ripper Walking Tour in London – 2 hours / £14 £12. Private / Group Tours price £160 (1-20 persons). – Walking London’s Shadows Since 1982. 2 Hours tour starts at 7pm every night. Cost only £10 per person. PO Box 53131, London E18 1UW, England. Tour Booking : Book your tour here. 2 hours tour is free to take, and you get to decide what or how much to pay when it’s done. Tour dates : Thursdays at 18:30 (6:30pm) and Saturdays at 6:30 pm (18:30). Reservations : Book your jack the ripper tour here. Tours Run 3 Times Every Day at 10.30am, 1.30 pm & 7.00pm. London E1 7PT, United Kingdom. Booking : Book a tour here. The Jack The Ripper Tour – (Duration 2 1/2 hours) ADULTS £10 / UNDER 16s £5. Tour Offers : public tour, private tour and School Tours. Do you want to book the Ripper-Vision™ Tour? Book Online Here. Tour time : Everyday at 19:30 PM. Tour Starting Point Exit 3 Aldgate East (At Whitechapel Art Gallery).